Foodborne diseases are a major public health concern worldwide. Every year an estimated 600 million – about 1 in 10 people – fall ill after eating contaminated food and 420 000 die, according to the World Health Organization. To help address food safety, the EU-funded FRESHDETECT project is developing a portable tool that will determine the microbiological quality of meat products. A product flyer on the project website notes that the handset determines the "total viable count (TVC) in raw meat without extracting samples and without incubation." 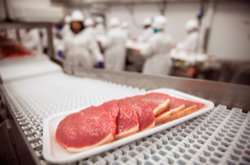 It uses a fluorescence spectroscopy process that directs an intense blue light onto the surface of the meat and measures the characteristic fluorescence signatures and the bacterial flora. "The TVC is then calculated using a reliable analysis algorithm to ascertain the microbiological quality of the product. The measurements are non-invasive and last only a few seconds. The results are displayed directly on the device immediately after the measurement." The device can store up to 2 000 measurements. The results can be transferred to a PC any time via a USB port. As stated in the same product flyer: "Potential fields of application include rapid tests for the in-house control of meat across the entire meat handling and processing chain, as well as delay-free quality monitoring in the receiving and shipping areas." In a news article on the 'FoodNavigator' news website, managing director of project coordinator FreshDetect GmbH Oliver Dietrich said the innovation "creates a new dimension in food safety." According to CORDIS, the "device enables non-invasive microbiological testing without additional operational or maintenance costs." The target users include slaughterhouses, cutting plants, meat processing companies, retailers, wholesalers and butchers. The project aims to bring its "current prototype (TRL7) [technology readiness level 7] to business success with commercialization to these users," CORDIS adds. In the same news article Dietrich says: "FreshDetect will successively expand its applications to include other food such as fish, dairy products, fruit and vegetables. The focus is not only on bacterial contamination, but also on the detection of pesticides, herbicides, origin, age (degree of ripeness) and other factors." The ongoing FRESHDETECT (FRESHDETECT – food safety – fast and reliable) project also tackles food waste, which creates about 8 % of all human-caused greenhouse gas emissions. Some 88 million tonnes of food are wasted in the EU every year, with associated costs estimated at EUR 143 billion, according to the European Commission. CORDIS emphasises that "the FreshDetect technology offers a so far unmatched level of food process control allowing an optimization of the food production and minimizing food waste." The project website notes that although the device has been on the market since the summer of 2017, "it has undergone a series of tests since 2016 that are carried out in conjunction with quality-focused companies in the meat industry." It adds: "We currently offer software datasets for various types of meat. Other datasets for detecting TVC are under development. We are also developing a technology for detecting TVC through transparent packaging (MAP, vacuum)."